Kenneth Baer and Andrei Cherny introduce Issue #10. Reading this issue of Democracy means taking a brief break from the endless commentary, TV advertising, email solicitations, and all-consuming campaigning that has dominated this election season. It is admittedly hard to do. The 2008 elections are historic for many reasons: the barrier-breaking candidacy of Barack Obama, the most wide-open presidential race since 1952, the record amounts of money raised and spent, the use of new platforms like YouTube and Facebook, the flood of interest and excitement the race has generated, and of course the huge issues at stake. Such phenomena have brought a wave of nonstop media attention, not just from the stolid New York Times but from even the likes of “Access Hollywood.” These days, everyone’s a political handicapper, and punditry is the new national pastime. Having worked on our fair share of political campaigns, we are not immune to this excitement. But precisely because of this experience, we founded Democracy with a decidedly non-political mission. We intended it to be an island of serious thought untouched by electoral politics. We are not interested in who is up and who is down, which TV ads are more effective, what messages are working, what new kinds of get-out-the-vote techniques are mobilizing key constituencies in various swing states, or even what policy proposals will translate into success at the ballot box. There are plenty of people and institutions who deal with those matters. But what is often lacking in American politics is the thoughtful consideration of which ideas are truly equal to the tasks before us, of which worldview is appropriate for the age we live in. The lesson of history is that enduring coalitions are built around big, transcendent ideas–not the other way around. 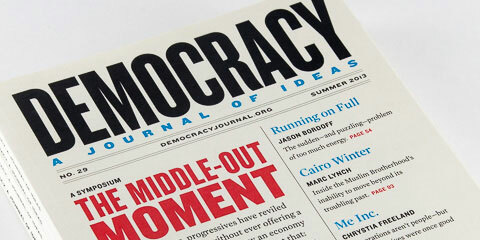 With that in mind, this issue of Democracy examines the upcoming elections, but from a macro perspective. Joseph Nye Jr., who has worked with and studied presidents throughout his career, looks not at who should occupy the Oval Office, but what kind of leader we need sitting there in light of the challenges we face today. Walter Shapiro, a veteran political journalist, pokes behind the scenes of the presidential campaigns to explore how political consultants have transformed the electoral process here and abroad. Karen Hult, a professor of political science at Virginia Tech, examines the presidential appointment process and the role staffing the federal government plays in affecting policy. Andrei Cherny looks at the myth of politics ending at the water’s edge and argues that it stultifies our foreign policy debates during campaigns. And Eric Lane, from Hofstra Law School, focuses on the electorate itself, calling for renewed civic education to reinvigorate our democracy. Other articles unpack some of the biggest issues affecting the campaign–not the individual policy differences, but the larger trends shaping the world that the next president will inherit. Theda Skocpol and Suzanne Mettler argue that recent promises by Harvard, Yale, and their peers to waive tuition for middle-income students are merely p.r. stunts, and that we need federal involvement and reform if we really want to expand college access. Former Undersecretary of Commerce Robert Shapiro examines the changing global economy, and David Callahan of Demos looks at how these same forces are affecting the middle class at home. And Michael Lind, a frequent contributor and a senior fellow at the New America Foundation, calls for a new American System to build the physical and financial infrastructure needed for the twenty-first-century economy. Looking abroad, Abbas Milani–head of the Iranian Studies program at Stanford–takes a critical look at Mahmoud Ahmadinejad and Iranian politics. Democratization expert Thomas Carothers assesses the state of democracy promotion post-Iraq. Journalist Oliver Tickell takes issue with Ted Nordhaus and Michael Shellenberger’s call to scrap the Kyoto Protocol. And Nick Cohen, a columnist for the London Observer, argues that American liberals must understand how the European left lost its way in order to find their own. This issue won’t tell you much about the latest flare-up in the ad wars, which way the swing states are leaning, or who will win in November. But we hope it helps explain what the country needs to do once the next president takes office in January.